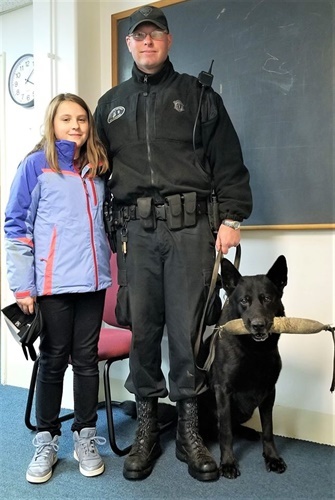 A 9-year-old Haverhill, MA, girl has been recognized by the Massachusetts State Police for her generosity after she saved up her allowance to buy treats for a K-9 officer’s partner that helped keep her school safe during a manhunt for an armed suspect in August. Haverhill’s Silver Hill Elementary School was among many schools placed in lockdown as a fleeing suspect armed with a handgun roamed the area on Aug. 29, state police said. Trooper Thomas Janeczak and his K-9 partner Tank later located the suspect hiding in a shed near the school. Olivia Feil, a fourth-grade student at the school, was so thankful for Tank’s actions that she began to save her weekly allowance to buy him some treats and toys, WHDH reports.